And that is so true…at some point most of us tend to get self-critical and judgmental. As an artist-in-the-schools, I’ve seen it in students as young as 8 years of age. Let’s make “Artwork” an oxymoron! Anyway, those art “works” must send out some kind of kharma. A family came over to celebrate their daughter’s 17th birthday party. We had a clay party with family and friends, ages 5 to adult. While one of the adults was fussing over his work (for him, it really was more like work than play), his five year old son would make something wonderful, gleefully mash it and create something new. He did this at least half a dozen times. I finally told him I’d be happy to give him as much clay as he’d like, that we can put all of his masterpieces in the kiln. Nope, he was having a great time creating and re-creating. My friend Wendy (an awesome metal and glass artist) volunteer-teaches a weekly art class at a senior center. Her students have seen a lot of life and are still going strong. She asked me to fill in one day, which I was happy to do–figured these people had a lot more to teach me than I could possibly teach them. Ten or twelve women came in–one in a wheel chair, some a little slow moving, all excited about the upcoming “adventure.” I’m sure they come in to Wendy’s classes like that every time. One lady stood in the doorway and did a little dance, a nonverbal way of saying she was happy to be there. She was 97 years old, by the way. A few people stopped by to tell me, “We’d love to take your class, but it conflicts with aerobics. Sorry!” Wow–how could I be upset about that? The plan was to make clay faces–I call them Garden Spirits, human faces with leaves for hair. I showed an example, along with one of my Kitty Gargoyles, faux finished to look like marble, as an example of how I thought we could finish our Garden Spirits. (One of my artist-in-the-schools offerings is a gargoyle unit.) The director and another member of the staff joined us. One lady said, “I want to make a cat!” In two minutes, everyone else did, too. Who was I to argue? 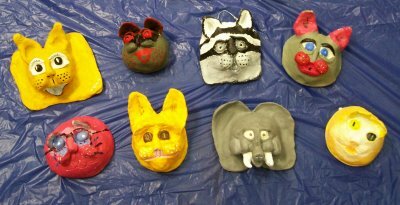 We made cat faces (one cat turned into an elephant–these things happen….). One lady was careful and perfectionistic–I have to include that for completeness and to convey how difficult the habit is to break. But the others threw caution to the wind! 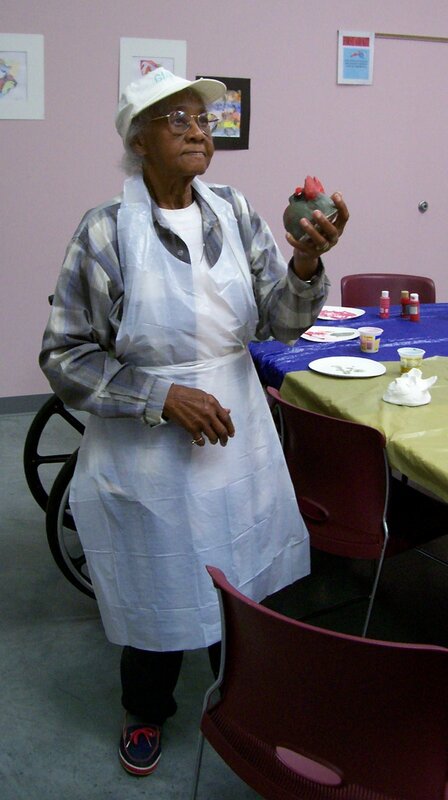 Some had arthritis and needed assistance; some created cats that were not so realistic; one woman made a cat in honor of a kitty she had earlier in her life. They had fun sculpting. They had even more fun painting when I came back a couple of weeks later with the fired pieces. I think the red cat looks like one of the Beatles during their Yellow Submarine phase. By the way, that 97 year old lady is still with us (she is now 98 years young). I haven’t seen her since, but am told she hasn’t changed a bit! So what happens to us between ages 5 and 97? So many things…. Needless to say, if you come to the studio and want a handful of squishy clay to play with, just ask. Then have fun smooshing it in your hand or making art. Neither you nor your creation will ever be criticized. I may offer a suggestion if I think you’d like to hear one. If you want a critique, just ask ask. I’ll be gentle. This is a supportive, nurturing environment and always will be. BUT–don’t ask me to dance in public–I can’t move nearly as well as that lady.